Review: I am a huge fan of established, loving couples going through turmoil, losing their step, and then reconnecting stronger than ever. We really need more stories like this in MM genre. Seth and Casey are two such souls. Friends since childhood and married for five years before tragedy strikes. 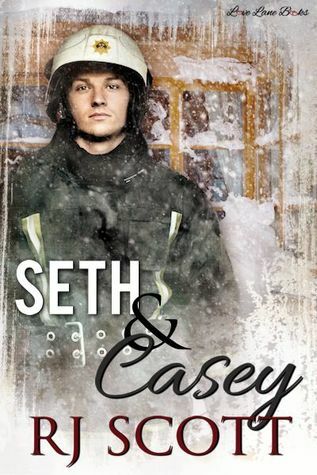 Seth, a firefighter, almost loses his life, loses his job, and is in the the process of losing his sanity, along with his husband, Casey, after a tragic on the job accident. You feel for both of these guys, they are in a rough spot with no easy answer on how to fix things. Seth feels like the sky is falling as he is the “man” of the household and struggles with the appearance of being weak. Casey just wants to help, he wants Seth to seek counseling, and he wants to the man he married to come back to him. The majority of the problems are with Seth, and one cannot fault Casey for much, if anything. Anyone would do the same thing in his place. But, Seth needed a new reality, and what a better eye-opener than realizing the reason your heart beats is no longer in your bed, and is in fact, in danger. This is a short story but full of an emotional punch. We don’t get the full backstory, but we get enough to know that Seth is a meathead, and Casey deserves better…but Casey only wants Seth, and eventually, Seth realizes he is being a meathead and makes the changes necessary to accept his new life and be the husband Casey needs. I liked this story a lot. It starts off on an uneven keel as the guys are already at odds, so we must piece together what makes them “Seth/Casey Forever”. It doesn’t take long, and once Seth opens up to Casey about his fears, the rest takes care of itself. For me, established couples going through a rough patch is more realistic than any other trope in this genre. Here’s hoping more like this one are in our future. Highly recommended.